I started out by stamping Moon #1 from Kitchen Sink Stamps Owl & Autumn Moon in Versamark, then letting it dry. I brayered over the image with Pumpkin Patch Ink using the Spectrum Roll Technique. Dried my card stock then stamped Tree #2 in Chocolate Chip, #1 in Desert Sand. I randomly added leaves #1 and #2 (smaller leaves) using the Pumpkin Patch Ink. The Bats were stamped in Black. The beautiful Pumpkin is from the Pumpkins set stamped as follows: #1 Tangelo stamped off, #2 Tangelo, #3 Tangelo 2x's, #4 Potters Clay stamp off, repeat, #5 Potters Clay. For the Stem: #2 Old Olive, #1 Desert Sand. For the cute pumpkin face: #2 Black, #1 Potters Clay. I masked the pumpkin with Eclipse Tape, then randomly stamped the larger #2 leaf in Old Olive, #2 in Tangelo stamped off. Sponge the edges with Brown Ink, layer on black. The funky patterned paper is Basic Grey Eerie, I love this paper pack for Halloween images. This card is just BEAUTIFUL! Such wonderful details and coloring!!!! What you can do with a stamp GF, just amazing! This set is adorable, I luv what you did with it. Moon turned out too kewl! 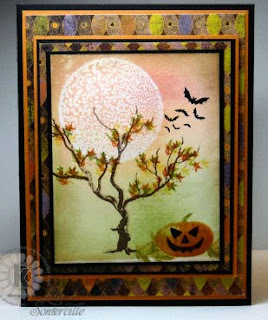 Love this fabulous Halloween card, Lisa!! The bats and jack-o-lantern give it a spooky, scary look!! Great work on this wonderful card!! oooh! Love your eery scene, Lisa!! Great combo of the two sets, and I really love your moon! I love this moon and the tree. You did great things with them both. Oh and the pumpkins are to die for. Great card. WOW! Love the detail. Love the card. What a fabulous scene, Lisa! Love how you combined images from different sets here. Wow! I absolutely LOVE it. The gradation in the sky adds such depth. The tree is PERFECT! Another amazing creation Lisa. Thanks for your inspiration.